Every once in a while you find an item of clothing that feels so good on, that you would like to wear it all the time. 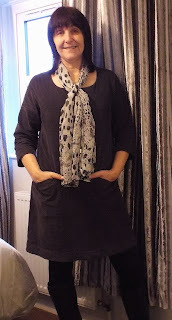 Well just last week I received a Cord Tunic Dress from Nomads Clothing which ticks all my boxes, the texture of the fine cotton needlecord is so comfortable to wear and I just love the way the dress hangs (no clinging to bits I’d rather cover up). I chose the colour Smoke which is such a gorgeous shade to mix with ethnical accessories. The neckline fits well with lots of jewellery designs meaning it can be dressed up with glamorous sparkles for the evening, or with some chunky beads and boots for a more casual look. The sleeves are three quarter length which is great for me as I usually push sleeves up which can be quite annoying and the two pockets on the front are just great for popping my phone in whilst walking about. Nomads Clothing is owned by Vicky and Duncan who met whilst travelling in India and this has influenced their styles to this day. I love the style of this brand, it is so me, feminine, comfortable and full of style whilst being suitable for a wide range of occasions. All the detail on their clothes is done by hand, from tie dying to embroidery and block printing. Clothes are made of organic cotton which means everything is eco friendly. It really is worth paying them a visit, I hadn't heard of them previously but they will definitely be on my list of future online shops to buy from. I also have a great opportunity for readers of my blog to receive a 20% discount off any item using the code ‘BLOG20’, why not give them a visit there are some really beautiful items to choose from. I received this dress for the purpose of this review but the opinion is entirely my own. I really like this, it looks incredibly versatile and you really suit it. I think this looks fab! Very versatile and will last a long time! The dress is stunning and you look amazing in it ! That dress looks stunning on you and what a great colour. It's so versatile as it can be dressed up or down. Great dress - I really like easy to wear dresses and this one looks like it could be dressed up or down too which is a bonus.